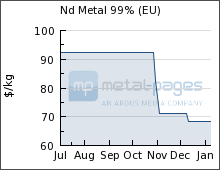 The Price of Neodymium – Another drop? In our last exciting report on the Price of Neodymium it looked like the price per kg of the Rare Earth magnet material had stabilized in the upper 80’s. Another 6 months have gone by and what has happened? Well, looks like it took another hit. The price dropped suddenly in November and hasn’t recovered. In fact it seems to have dipped a bit more in December. What happened? It may be hard to tell, some articles point (indirectly) to how China’s efforts to restrict the export of rare earth magnets may have backfired on them as they now possess an overabundance of production and markets reducing as hybrid cars reduce their rare-earth usage and the US is set to restrict the usage of rare earth magnets in toys. Another factor might be the global drop in oil prices, which have resulted in reduced costs across the board. Will this continue? It is hard to say. One source states that China is continuing to restrict their market production while expressing concern about their drop in the market share. We’re scientists, not market experts, so we cannot say for certain. Neodymium magnets are used in stereo loudspeakers, TV’s, turbine systems, car parts, science instruments, and even smartphones. 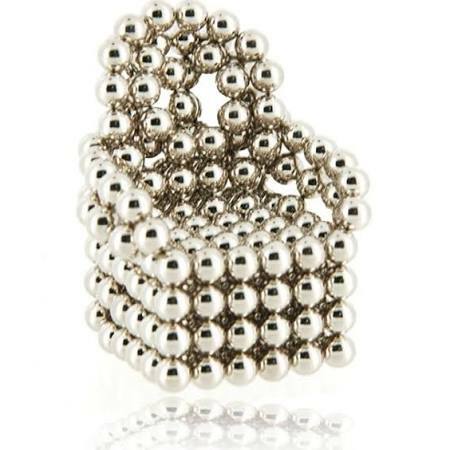 Buckyballs, ALL rare-earth spherical magnets to be banned. But is the CPSC being honest? 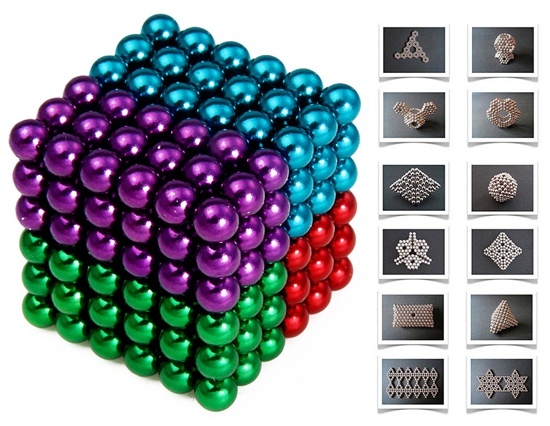 Scarcely a handful of years ago, the rage in magnets was BuckyBalls, the little spherical magnets that were fun to build and just fidget with. BuckyBalls were not the only producer of these magnetic spheres, but they were definitely the best known and most popular due to their aggressive marketing campaign. However this popularity made them a huge target for any product issues and BuckyBalls was soon hammered by lawsuits brought by the CPSC and eventually were effectively forced out of business. The reason? It was alleged that many children were swallowing the magnets and when two magnets attached in the intestines the skin could necrophy and sometimes surgery was required. BuckyBalls stated they were aware of two dozen emergency room cases out of 3 million of BuckyBalls sets sold, while the CPSC claimed over 1700 cases. BuckyBalls agreed to multiple warnings on the box agreed and to not sell the magnets in toy stores, but it wasn’t enough and the CPSC, in an unprecedented move took action to push BuckyBalls out of stores. Unfortunately, the company that produced BuckyBalls, Maxfield & Oberon, did not handle the situation well. At times they made reasonable replies, but at other times the company’s founder went on anti-Obama screeds that did little to defend the company’s position and probably estranged would-be supporters. That being said, the push on BuckyBalls may have been the CPSC’s least popular action ever. But that didn’t stop them from pushing harder. 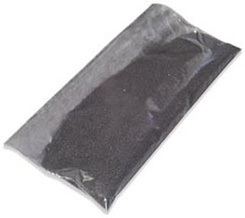 Last month they put into law a total ban of rare-earth magnet sets to take place in 2015. 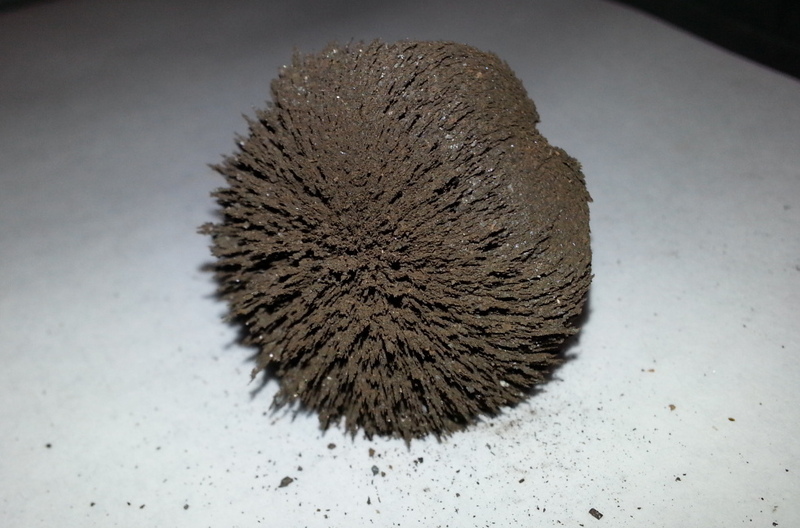 BuckyBalls, as noted earlier, are not the only spherical rare-earth magnet sets on the market. Even we at the store sell sets (although not online, and they are kept in a cabinet), at least two other companies, Magnicubes and Zen Magnets, sold the magnet sets. only Zen Magnets remains. The short version is: It seems the CPSC was using a very, very loose Venn diagram of search terms used in emergency room cases (words like ‘rare’, ‘powerful’ ‘spherical’ were all accepted) and considered any case that fell into that diagram to be a spherical magnet case. On its own that is shaky research, but it gets worse when the same terminology is used on the 3 years of emergency room cases prior to Spherical Magnets being introduced and shows there were just as many cases that fall under those terms over those 3 years. The raw data from which the CPSC extrapolated their ‘1700 cases’ can be found here with highlighting to note the period when spherical magnets were introduced and what cases are doubtless caused by ingestion or aspiration of spherical magnets (most emergency room visits did not involve surgery). Savemagnets.com is the place to visit to see latest developments in the attempts to prevent a CPSC ban.